In a meeting with members of the Egyptian parliament's economic affairs committee on Tuesday, Egypt's Minister of Finance Mohamed Maeet said that despite complaints by citizens about the harsh living conditions brought on by the government's economic reforms, Egyptians will reap the fruits of economic reform in a gradual way. The minister assured that citizens are already feeling the positive effects of the reforms, as the government has managed to reduce inflation rates and make sure that basic goods and services are available at all times on the market. Maeet revealed that the first half of the fiscal year of 2018/19 shows that Egypt is achieving a lot of progress on the road to cutting public debts and the budget deficit. He told MPs that recent economic indicators show that Egypt has been able to turn the budget deficit into a surplus for the first time in a decade. "As a result of four years of wise fiscal policies, Egypt was able to turn the estimated budget deficit into an estimated surplus of EGP 4 billion (or 0.1 percent of GDP) at the end of the 2018/19 fiscal year... and this means that Egyptians have begun to use their own money to eat and drink," said Maeet. "The government further aims to raise the budget surplus to 2 percent of the GDP and reduce the deficit to 8.4 percent by the end of the current 2018/19 fiscal year -- or at the end of June 2019," the minister added. Maeet said that "due to the good economic indicators, the government has refused to change the current budget simply because there is no reason for this, and because we are now achieving the required objectives within the limits of this budget and without any more borrowing." Maeet vowed that the Ministry of Finance will submit to parliament a detailed statement about the results of the first half of the 2018/19 fiscal year. "This statement will include a financial and monetary evaluation of the state budget in the first half of the current fiscal year, as well as preliminary figures on the upcoming budget of the 2019/20 fiscal year." 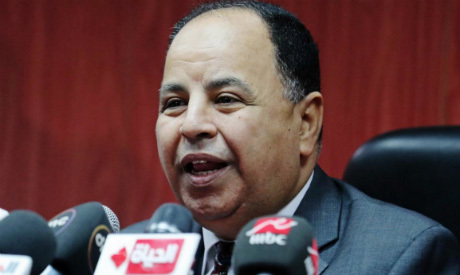 Minister Maeet also said that the government is also working day and night to reduce Egypt's public debts to less than 70 percent and cut the budget deficit to less than 5 percent of the GDP in the future. Maeet explained that public debts grew to alarming levels in recent years in Egypt due to the political upheavals the country faced after 2011, but at the end of 30 June 2017 and due to severe measures, things have begun to turn for the better. "On 30 June 2017, public debts stood at 108 percent of the GDP, and this was a very alarming figure, but after one year this figure was cut down to 92 percent of GDP, with the government seeking to decrease it to 80 percent of GDP in 2021 and less than 70 percent afterwards," said Maeet, revealing that the government is under strict orders from President Abdel-Fattah El-Sisi that it should do more to cut the general debt to even less than 70 percent. "Our response is that we can implement the president's orders, given the fact that the components of our economy, including tourism, industry and natural gas, can help us do away with foreign borrowing in the future," he added. The minister also pointed out the success of the government in generating EGP 1 billion to spend on a campaign to eradicate hepatitis C.
"We were able to procure the allocations necessary to cover spending on this campaign from our own financial resources, and this was a very significant step," he added. "We hope that all our needs will be covered by our own financial allocations, and not by borrowing from foreign institutions," said Maeet, adding that "this is a necessary strategy so that the next generations of Egyptians do not face a high burden of foreign debts any more."